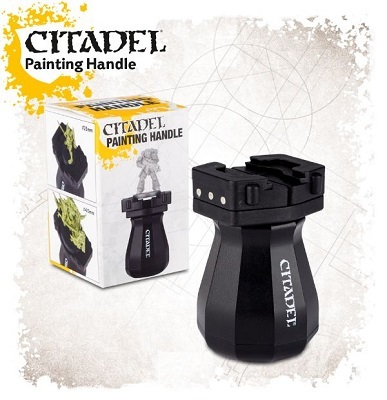 Making it much, much easier to hold your miniatures securely while painting them, allowing you to find the perfect angle with which to access the fiddly bits while avoiding the inevitable hand cramps that come when holding a base for a long time, the Citadel Painting handle has been designed for painters, by painters. If features a spring-loaded clamp mechanism, which locks tightly onto 25mm, 32mm and 40mm round bases, as well as fitting 60x35mm oval bases. Grasping the sturdy plastic handle rather than the base or miniature you?re painting means fewer smudgey mistakes from careless fingers and will help you improve your painting all round!